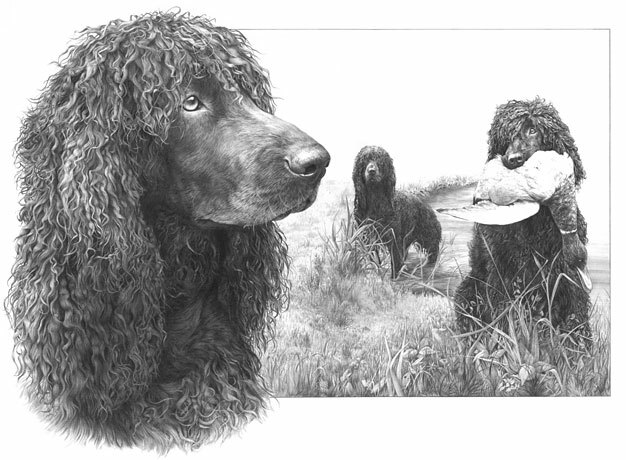 This Limited Edition print was produced for the Irish Water Spaniel Club of Great Britain. The edition of 50 prints was released at Crufts at 8:30am and sold out before mid-day! Originally sold at £45 each, the prints were soon changing hands at £450 or more. This print is still much sought after. The scene itself is purely imaginary although the dogs were drawn with the assistance of photographs provided by the Club as I had little knowledge of the breed at that time. The original drawing took 116 hours 34 minutes to complete and is now in a private collection in England. image : 18½" × 13½"